1656: opening of the Kawarasakiza by Kawarasaki Gonnosuke I. 22nd day of the 7th lunar month of 1690: the zamoto Kawarasaki Gonnosuke I (1596~1690) dies. 1735 ~ 1744: first period of production for the Kawarasakiza since the implementation of the rule limitating the number of theaters in Edo, which receives the license for Kabuki performances from the bankrupt Moritaza. 4th day of the 8th lunar month of 1738: the zamoto Kawarasaki Gonnosuke II dies. 24th day of the 1st lunar month of 1775: the zamoto Kawarasaki Gonnosuke III dies. 1790 ~ 1797: second period of production for the Kawarasakiza, which receives the license for Kabuki performances from the bankrupt Moritaza. 4th lunar month of 1792: premiere at the Kawarasakiza of the dance "Tenaraiko", which is performed by the star Iwai Hanshirô IV as part of a seven-role hengemono entitled "Kakitsubata Nanae no Someginu". 5th lunar month of 1794: the drama "Yoshitsune Senbon Zakura" is staged for the first time at the Kawarasakiza (only the 4th act) with the following casting: Bandô Hikosaburô III (Minamoto Yoshitsune), Osagawa Tsuneyo II (Shizuka Gozen), Iwai Hanshirô IV (Tadanobu, the fox Genkurô) and Ichikawa Ebizô (Noritsune). 1796: Kawarasaki Chôjûrô II takes the name of Kawarasaki Gonnosuke V and manages the Kawarasakiza up to his death in 1830. 1800 ~ 1808: third period of production for the Kawarasakiza, which receives the license for Kabuki performances from the bankrupt Moritaza. 11th lunar month of 1801: Morita Kan'ya VIII and his son Morita Matakichi respectively take the names of Bandô Yasosuke I and Morita Kan'ya IX at the Kawarasakiza, playing in the drama "Ume ni Suisen Iro no Udezuku". 1815 ~ 1817: fourth period of production for the Kawarasakiza, which receives the license for Kabuki performances from the bankrupt Moritaza. 11th lunar month of 1815: Segawa Tamon I takes the name of Segawa Kikunojô V at the Kawarasakiza, playing in the drama "Yamato Meisho Senbon Zakura". 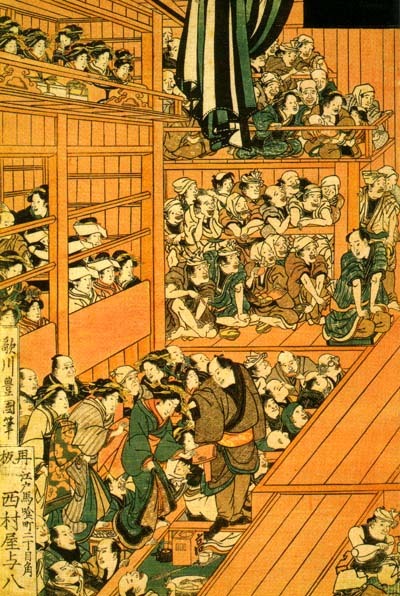 1819 ~ 1822: fifth period of production for the Kawarasakiza, which receives the license for Kabuki performances from the bankrupt Moritaza. 11th lunar month of 1819: Kawarasaki Gonnosuke V produces at the Kawarasakiza the kaomise drama "Yakko Yakko Edo no Hanayari". Premiere of the Nagauta-based dance "Shikakubashira Saru no Kusemai", which is written by Segawa Jokô II and stars Ichikawa Danjûrô VII in the role of Konoshita Tôkichi. 9th lunar month of 1821: premiere at the Kawarasakiza of Tsuruya Nanboku IV's drama "Kiku no En Tsuki no Shiranami". The main role is played by Onoe Kikugorô III (Sadakurô). 1823~1833: sixth period of production for the Kawarasakiza, which receives the license for Kabuki performances from the bankrupt Moritaza. 11th lunar month of 1827: the Kamigata star Nakamura Karoku I arrives at the Kawarasakiza. 9th lunar month of 1829: premiere at the Kawarasakiza of the 4-role hengemono "Hana ni Chô Magaki no Ukareme"; all the roles are performed by Segawa Kikunojô V; the 2nd role, the komori, is still part of the current Kabuki repertoire and is performed independently under the title "Mitsumen Komori". 11th lunar month of 1831: Sawamura Gennosuke II takes the name of Sawamura Tosshô I at the Kawarasakiza, playing in the drama "Matsu o Chikara Tomoe no Fujinami". 1837~1855: seventh period of production for the Kawarasakiza, which receives the license for Kabuki performances from the bankrupt Moritaza. Nagauta Sawamura Tosshô I (Ariwara no Yukihira), Ichikawa Danjûrô VIII (a palace attendant) ??? 9th lunar month of 1839: premiere at the Kawarasakiza of the Kiyomoto-based dance "Shimero Yare Iro no Kakegoe", which is still part of the current Kabuki repertoire under the title "Kanda Matsuri". It stars Sawamura Tosshô I, Onoe Eizaburô III and Ichikawa Ebizô V.
11th lunar month of 1846: Matsumoto Kôshirô VI takes the name of Matsumoto Kinshô at the Kawarasakiza, playing in the drama "Ichi-no-Tani Yukimi no Takadono". 11th lunar month of 1848: premiere at the Kawarasakiza of the dance-drama "Takigi Ôyukima no Ichikawa". The leading roles are played by Ichikawa Kodanji IV, Bandô Mitsugorô IV and Ichikawa Danjûrô VIII. This dance is still part of the current repertoire and is staged under the title "Yamanba". 1851: Iwai Kumesaburô III becomes tateonnagata at the Kawarasakiza. His main stage partner is the young star Ichikawa Danjûrô VIII. 2nd lunar month of 1853: premiere at the Kawarasakiza of the dance "Yanagi no Ito Hikuya Gohiiki"; the role of Sanbasô is performed by Arashi Rikaku II. 2nd day of the 10th lunar month of 1855: the Kawarasakiza is destroyed by the Ansei earthquake (Ansei Daijishin). July 1874: reopening of the Kawarasakiza in the district of Shiba Shinbori-chô; Kawarasaki Sanshô and Kawarasaki Fukujirô respectively take the names of Ichikawa Danjûrô IX (not holden for 20 years) and Kawarasaki Gonnosuke VIII. The new Gonnosuke produces in his rebuilt family theater the drama "Shinbutai Iwao no Kusunoki". May 1875: final performance under the name of Kawarasakiza. The theater is sold by Kawarasaki Gonnosuke VIII to investors not related to the Kabuki world. They decide to rename it Shinboriza. October 1875: premiere at the Nakamuraza and the Shinboriza of Takeshiba Kinsaku I's drama "Minori no Aki Seishô Denki" [more details]. 1877: the Shinboriza goes bankrupt.